I have been fighting with my Oneida Pro 2000 since I bought it. Seems a lot of dust passes the cone and lands in the filter clogging it and making dust collection inefficient. So much so I have to take the filter outside at least once a week and blow it out with an air line the reinstall. For my drill press I purchased a Dust Deputy and use it on with a shop vac. It works wonderfully. There isn’t enough material that gets by the Dust Deputy to measure in the shop vac, so I concluded that if it works that well then a Super Dust Deputy will be the answer I am looking for. So I ordered a Super DD and it finally arrived today. Okay, so it’s a little smaller than I expected. If it does the job then size really doesn’t matter. As I have it upside down attaching it to the top of my barrel, I can see light through the joints around the inlet. Upon further inspection there are only to small spot welds around the inlet and the big gaps have been filled with silicone. Same with the outlet on the top, two small spot welds and the big gaps are filled with silicone. The main joint running down the height of the cone is also spot welded and then covered with silicone. But the joint at the bottom where it attaches to the barrel looks to be fully welded. A call to Oneida Customer Service confirms they only spot weld then fill with silicone. CHEAP! Okay, if it works as well as the Dust Deputy, then I can live with cheap construction. (Reminds me of some of the crappy construction I have seen at Harbor freight.) After 2 1/2 hours of sanding with no breaks, I can say conclusively it only works about as well as the Thein separator I made and maybe a little worse. Comparing a $210 Super Dust Deputy to a $35 Thein separator makes the Thein look like a real bargain. I did get a RMA for it and will send it off tomorrow. Sad, I still have the filter clogging problem and Oneida seems to not want to try to find a fix. I was going to buy one of those but think I will stick with my Thein which works very well for me. Sorry to hear about your problems with this unit. I purchased mine over a year ago and have had nothing but good luck with mine. My design exhausts to the outside of my shop with no filters, so this is where my design and yours differ. The only time I see dust coming out of the exhaust port is when I am running my drum sander. I have a good distance from my neighbors so I have the good luck that I can run it outside and no one will complain. Over all I like my Super Dust Deputy, you can see the design on my projects page. Question , did you hook this up to the same vac as the regular DD or something with more cfm. Ok, Dust is my collection specialty. Some collect antique furniture, I collect Dust ! Seriously, my dust collector is through a hole in the wall, outside the shop and the filters are not in my shop, they are in the lean-to next to the shop. Then, do not waist limited funds on an “in shop” filter. Instead cut another hole in the shop wall, install a squirrel fan to exhaust any unwanted or possibly “minutely” dusty air not captured by you dust collection system. risk if close attention to detail is not attended to properly…..love to turn. Denver, I like your idea of getting all the dust and dust collection equipment out of the workshop and that’s my plan for my new workshop. Despite all the reading I have done, I have seen lots on “in shop” filters but nothing on what sounds like a good idea of simplhy installing a squirrel fan to exhaust dusty air outside. My shop is deep in the woods so venting dusty air outside is no problem for me but I am looking for any input on how to best do that in my shop. My shop is 40 X 24’ so I am looking for info on what size fan, optimal fan location (high on wall, head height, lower? ), weatherproofing the fan, how do I minimize venting all my heated air (I live in Upstate NY), etc. I would love any input from anyone who has gone this route. I haven’t done this, but if you really want to conserve the heat I have seen heat exchangers designed for houses. They take outside air being drawn in and exchange it with conditioned air being exhausted, conserving some of the energy you put into conditioning your shop air. I can’t see why they wouldn’t work in the shop. I’d just make sure you can clean it if you go that route, as I’m sure some dust will accumulate over time. I have to admit surprise at the SDD problem you have; and I do like the idea of outside venting (short of the heat loss issue – I live several hundred miles south of you (Annapolis), and the winters here can be very cold). I have a low-tech, relatively low-cost solution – 4” mains from most of my stationary equipment to the SDD, then a single-stage Delta. My air quality is very high. I run Jatoba, Cherry, White Oak, and Maple on a regular basis, and I can hardly smell the dust (a stream from my Table Saw, and copious debris from my miter saw & router do pollute …). When the budget allows, I’ll get a Powermatic or JDS air purifier unit. Outside Venting – I have an un-heated, detached workspace, and the winters shutdown the shop for two months. 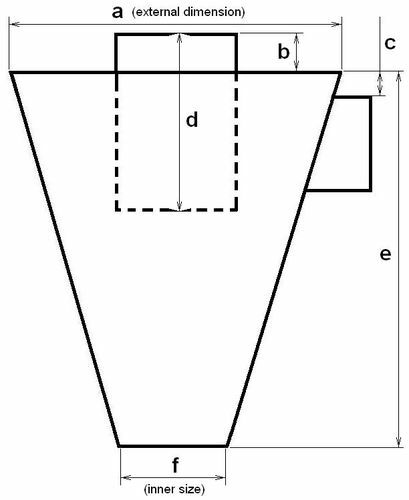 I don’t know how to solve this without Heat Exchangers ($$$) – a tough financial trade-off analysis might prove beneficial. How much dust do you get off of your drill press is my question ? Are you using the SDD on the DP as well , or on another machine ? Why aren’t you using your Thein for all of your DC needs ? My dust off the drill press is not worth measuring, to be candid. What I normally do is clamp the vac hose (which goes through the smaller DD) near the spindle, and this is sufficiently effective. Certainly, it’s not production-grade, but it does get the job done. I don’t do deep mortises or forstner-type drilling, so my dust is not that much. The Thein approach is one of many, and I’ve read where the efficiency is respectable (mid-80%s, whereas the DD will yield in the 90%s) – in this manner, the Thein is probably the more cost-effective; however, I have also read that the CFM is significantly reduce with the Thein, due to the abrupt disconnects in the air stream. I can not say from my experience; other than the DD is a mini-cyclone, and this is a proven approach. 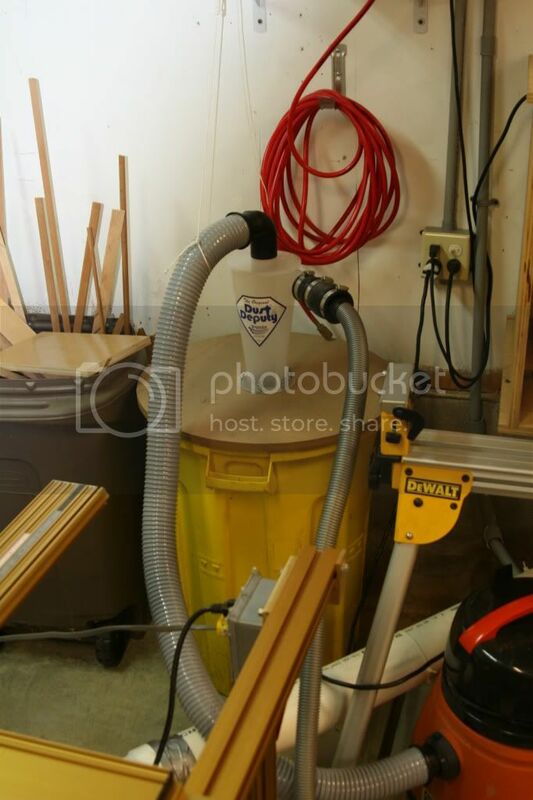 On the DD (shop vac), I’m using a rigid (reinforced) plastic 40 gal container, with a 1/2” MDF top mounted to the DD. The can has weather-stripping around the top, to form an airtight seal when suction is applied. I tried using a 30gal Brute plastic can, and it imploded from the suction (I was very surprised). 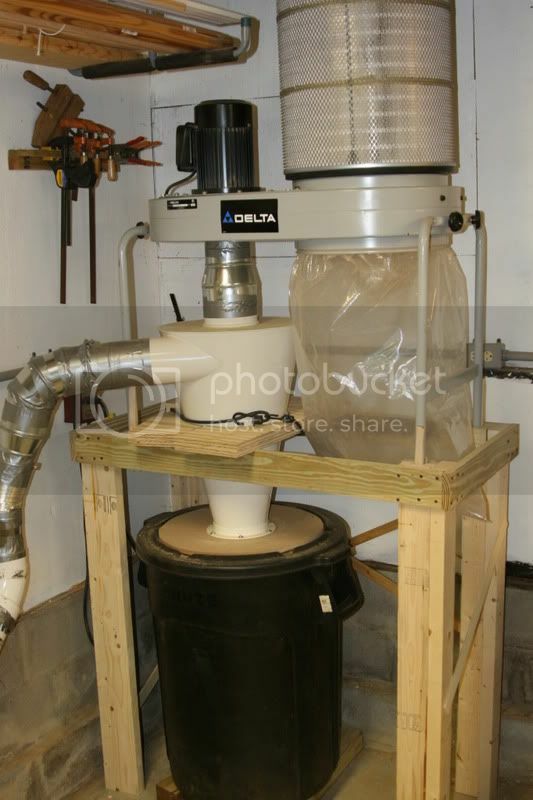 The SDD is used within a stacked assembly – compliments or TechRedNeck, on this site – the 40/50gal container sits on removable 3” rails, and the SDD directly feeds my Delta single-stage DC – it is very effective, and low-cost compared to a true cyclone. Thanks for the info about the two spot welds in the construction, I WAS going to buy one but now have second thoughts, Clearvue? Or make my own using Bill Pentz drawings scaled to my need? Seems there is a gap in the market here, with the hullabaloo about the tobacco companys, and all the awareness about lung health, when it comes to the proven danger of dust in the average shop, very few manufacturers have come up with a foolproof method to deal with this danger – which is far more insidious than any sharp table saw blade. You could probably get close enough by measuring off the picture and using the 4” hose size as a reference. Folks, you all need to remember that there isn’t a Separator or a Cyclone thats going to separate fine dust before it gets to the filter, it’s the reason that they all have filters. So if you do alot of sanding, expect your filters to need cleaning more often. It’s just the way it is.